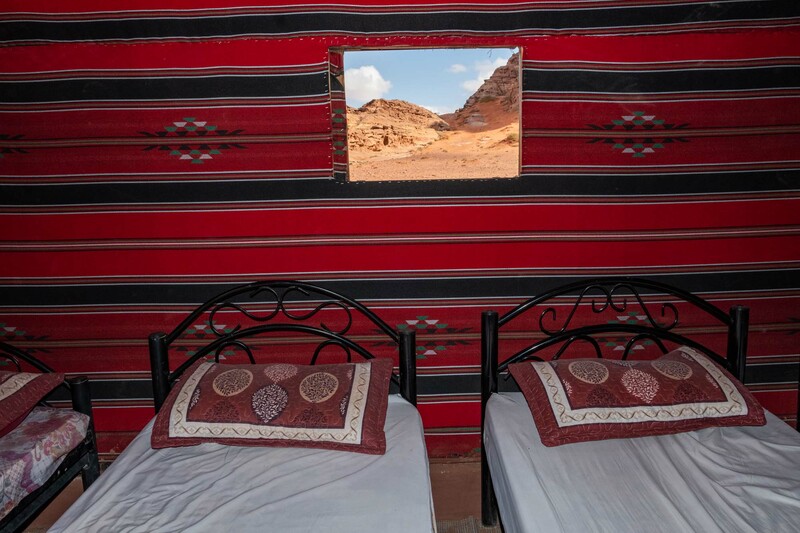 We recently spent 2 days and nights at Um Sabatah Camp (<- book here) in Wadi Rum and it was AMAZING! My only regret is that we didn’t spend more time there and we are desperately looking to go back. Two days is definitely not enough. 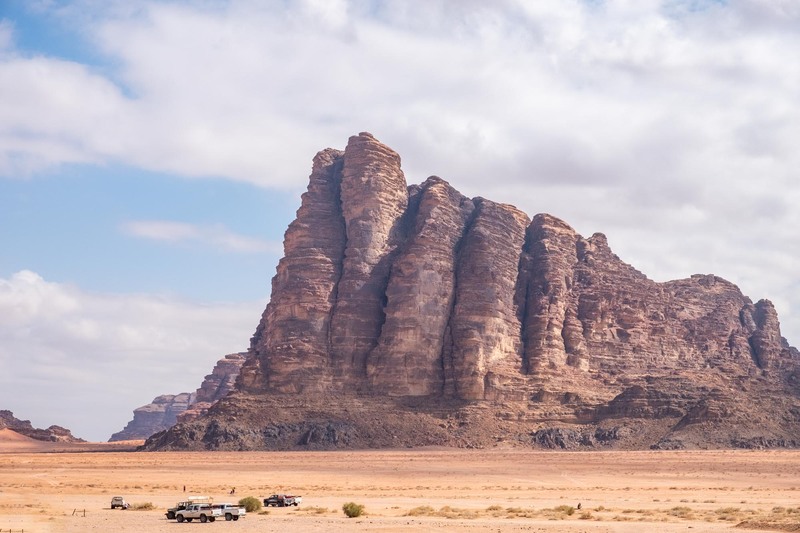 1 What is Wadi Rum? Wadi means valley in Arabic and if you explore the country enough, you’ll see Wadis make up a large proportion of the country. 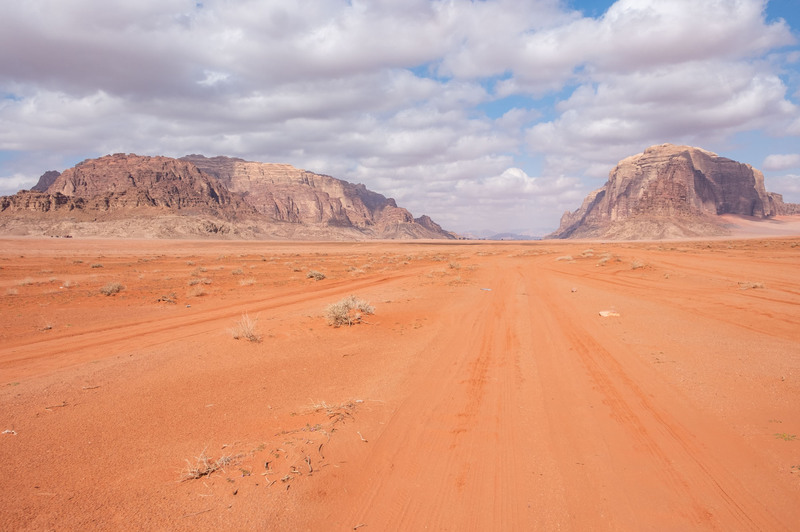 Wadi Rum is a parallel fault formed valley in the arid, sandy desert, south of the Shara mountains. Surrounded by giant granite, basalt and sandstone mountains, some of which rise up to 800m from the desert floor. The valleys hosts an abundance of canyons and ravines, naturally formed rock bridges, hidden springs and rolling views across the desert which seems to sweep as far as the eye can see. Wadi Rum is a Protected Area under the control of ASEZA and UNESCO declared it a mixed natural and cultural World Heritage Site in 2011. I have mixed views on UNESCO, mostly not so good, but that’s for another post! Wadi Rum is one of the most surreal places I’ve been. It has what can only be described as a Martian landscape of orange tinted sand, red sandstone and grey granite rock with an often beautiful, contrasting blue sky. It is no surprise that it’s been nicknamed ‘Valley of the Moon’ and that the movie Martian (featuring Matt Damon) was actually filmed there. It’s one of those places that must be seen to be believed. It blew our minds at seeing the expanse of 278 square miles (720 sq. km) of desert wilderness unfold before our eyes and we never got over that amazement. Oh and the night skies are beautiful. There are over 80 camps in Wadi Rum and it’s pretty difficult to choose one, especially as they all look and sound similar, but I had a very distinct criteria when I was looking and this is how I stumbled across Um Sabatah Camp. It must be geographically far into the desert. I definitely did not want a camp that was 500m from the visitors centre! It must be small and family friendly. I didn’t want a super large camp where you weren’t recognised as an individual. It must not accept coaches of tourists. This is my worst nightmare! I wanted as authentic an experience as possible. I didn’t want a camp that fleeced you for $ and saw you as nothing but a cash cow. And that’s how I found Um Sabatah Camp. 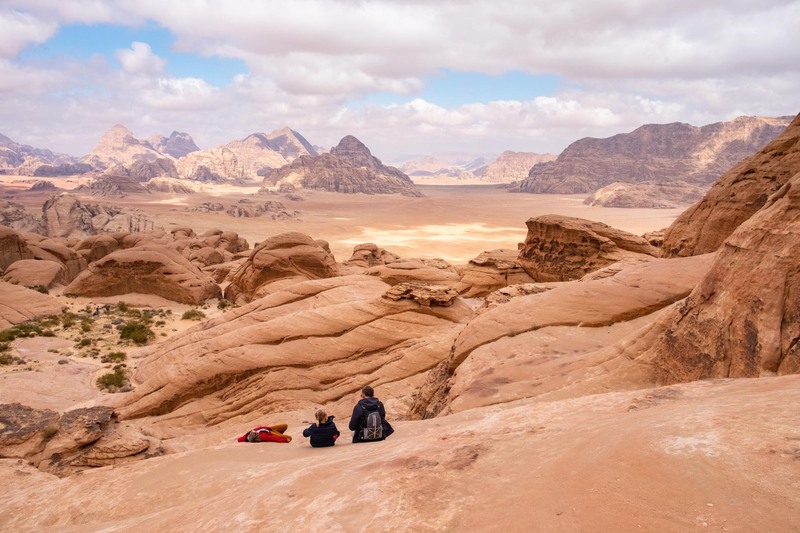 So, these are our 26 things to do in Wadi Rum. Clearly I didn’t get a chance to experience them all my self but I have definite plans to go back and do more. 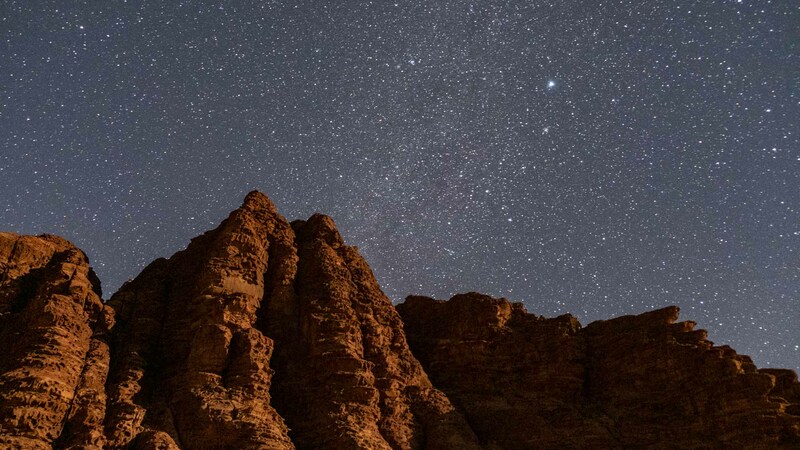 Here’s our list of 26 things that you could do whilst visiting Wadi Rum. Hiking Rakabat Canyon will take roughly 2-3 hours. This hike, like many in the area is definitely not for people afraid of heights and you should expect to get dusty with lots of rock scrambling. Great fun! Hike to Jabel Burdah Bridge or the mountain’s summit. 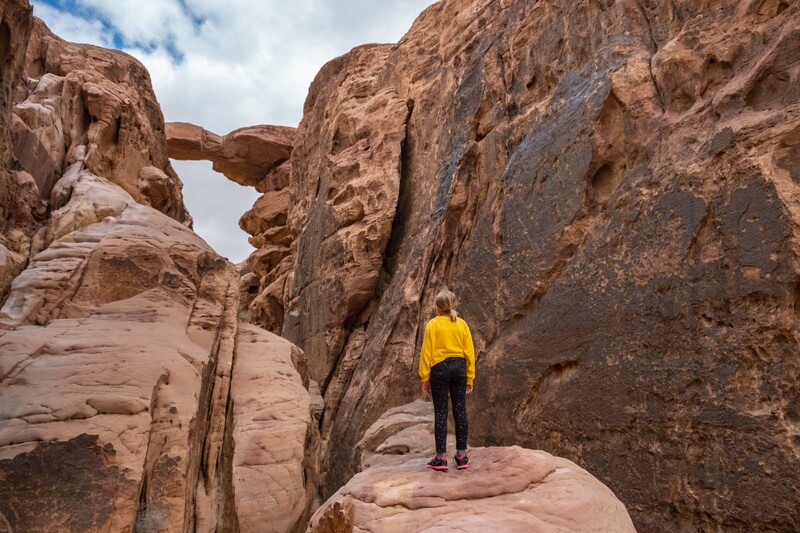 Hiking Jabel Burdah is a fun and semi-strenuous scrabble hike where you get to cross a 300m rock bridge. Up and down should take no longer than 3 hours although if you’re continuing to the summit, expect it to take 5 hours. You might be the only person actually hiking this – as we were. Visit the Little Rock Bridge the smallest of three rock bridges in Wadi Rum. It is super easy to climb and a little bit fun too. Um Fruth Rock Bridge is another unique arch BUT one of the most photographed landmarks in the area. Expect to QUEUE and wait for your turn to have a photograph on this 15m high bridge. If you’re going here go super early or just in time for sunset as the coach parties will have left by then. Roll or surf down the famous sand dunes of Al Hasany. You can rent boards from the shop at the bottom. Anfasheih inscriptions, dating back to 300BC, are one of Wadi Rum’s most famous historic sites. Located on the side of a mountain are an impressive collection of Thamudic and Nabataean petroglyphs complete with drawings of camel caravans. Hike Al Mushroom Rock which is a Stone shaped like a mushroom. Day trips just don’t do Wadi Rum justice. In order to appreciate the beauty you really must camp in the desert or sleep under the stars. Experience a Bedouin camp fire and music with a traditional lute. You can do this at Um Sabatah Camp with Taisseer. Book a 4×4 trip and sit on the back of an open top UTE. Take a hat because the wind is strong and your hair will look like you’ve been dragged through a hedge! Visit the deserted southern valleys to Jebel Khasch, a high ridge stretching east to west for several kilometres. 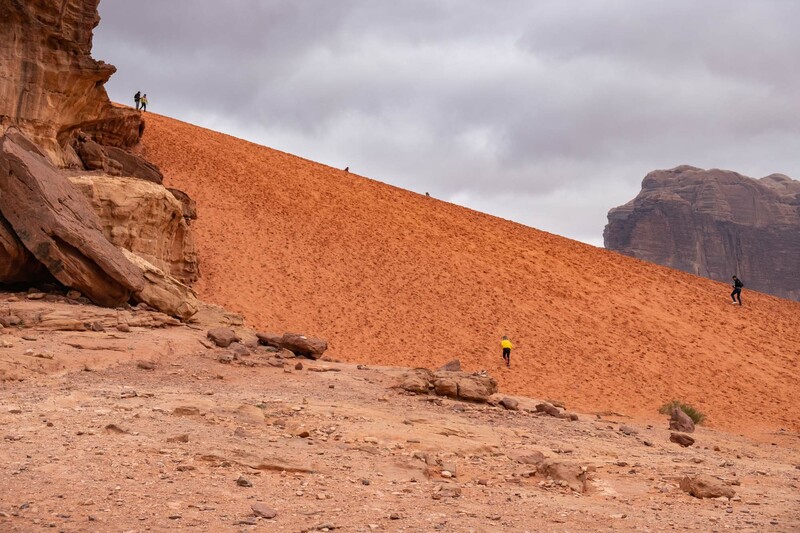 You must walk along the top of the ridge, admiring the views of Wadi Rum to the north and Saudi Arabia to the south. I am not entirely sure it is Lawrence of Arabia’s house but still it makes a nice story. Marked by a water tank near the entrance of Wadi Shallalah, the Lawrence Spring is a small spring in the middle of the desert. Ain Abu Aineh is often mistaken for Lawrence’s Spring, the ‘Father of Aineh Spring’ is piped down the mountain into a large tank for Bedouin sheep, goats and camels. Look out for a large boulder near the tank as it is covered with Thamudic inscriptions. Explore Barrah Canyon which is a five kilometre corridor of rock through the mountains. Visit the Nabataean Temple. This temple was constructed on another temple built by an Arab tribe. There are also baths in the remains of a villa nearby, as well as ancient nomadic and Nabataean inscriptions. Jabel Rum is the second highest mountain in Jordan. 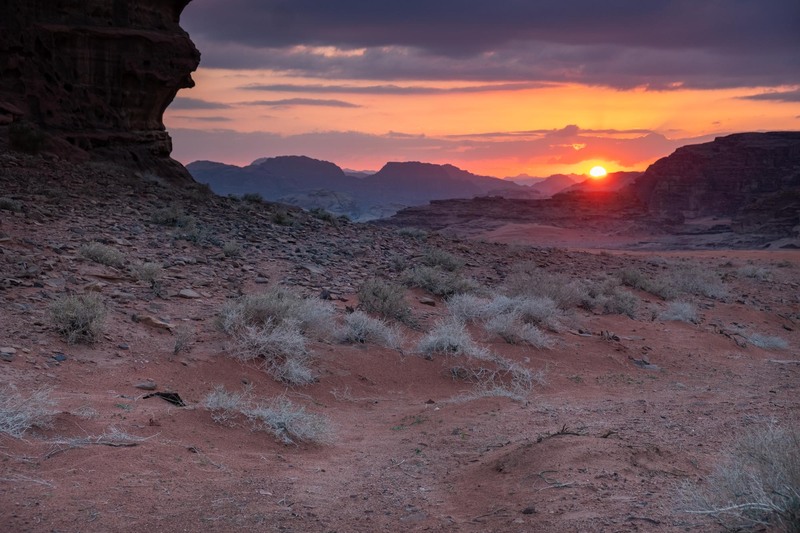 The western flank of Wadi Rum is formed by Jabel Rum (1754m), which towers over Rum village. Ancient pathways, once used for hunting ibex and collecting medicinal plants, link one massif to another throughout the area, giving limitless scope for day or longer hikes. 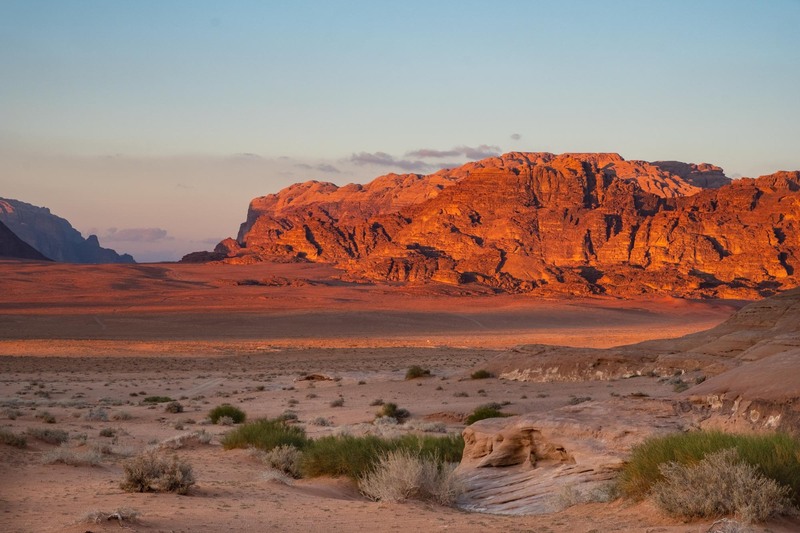 The deeply crevassed ‘Mother of Twenty’ (Jebel Umm Al Ishrin) is a 20-domed mountain forming the east flank of Wadi Rum. The mountain acquired its name, according to local legend, after a woman killed 19 suitors. She was outwitted by the 20th and so she married him. I’m not sure about the logic of that but the mountains turn a magnificent auburn during sunset. The Mother of Twenty is connected to the Seven Pillars of Wisdom formation. The name Seven Pillars of Wisdom is a new concept to attract tourists but it’s still an impressive sight. You can only see five from one direction and two from another. The local Bedouin refer to this mountain as Jabal al-Mazmar. See the petroglyphs of Jabel Khazali Khazali Canyon. JKK canyon is long and narrow and known for an impressive number of ancient petroglyphs and inscriptions on the rock walls. The first 100 yards are accessible to all visitors however beyond that point, you’ll need rock climbing skills and probably gear. Watch the spectacular colours of Um Sabatah mountain at sunset. Gaze upon the night stars but wrap up warm first! The highest mountain in Jordan is Jebel Umm ad Dami, just 10m higher than Jabel Rum at 1,854m. Located near the border to Saudi Arabia the mountain peak is home to hyrax, a small rodent like mammal that lives under rocks. Eat zarb and drink Bedouin tea. Zarb is a Bedouin-style BBQ, mostly made of meat, potatoes and all kinds of vegetables cooked underground in the desert’s sand. Hot air balloon high above the canyons with the Royal Aero Sports Club of Jordan (<- book there, opens in new link). Visit either the Desi Women Association or Burda Women Association and support local women through workshops, local arts and ceramics. If you’re not ready to leave yet, check out some of our other recent posts of what we’ve been up to in this beautiful world of ours.